Merete Stæhr-Nielsen, author of the Danish Kennel Clubs (DKK) The Miniature Schnauzer hand book 'Racehunde i Danmark' updated with a 2008 edition. Atelier Publishing House. 2000, 2008. We raise only one or two litters pr. year and they are not raised in a kennelrun. 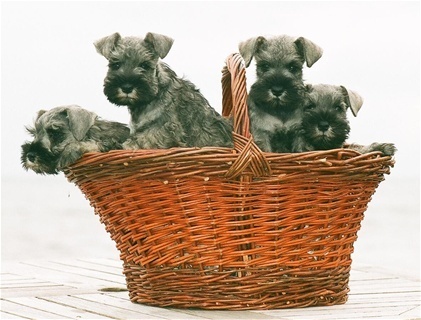 All our miniature Schnauzers live like any dog should - like a family member. Well they don't sleep in our beds, but they really make use of the house and the garden in every possible way leaving all the services up to us. And the paying of the bills as well. All our puppies are carefully housebroken. They run freely in our very big garden getting excercise and mental stimulation, which we find of great importance. Over the years we have had the pleasure of sending a good deal of our puppies to breeders abroad, and are of course both proud and grateful, that ' The Starlings' have been taken well cared of and shown well.